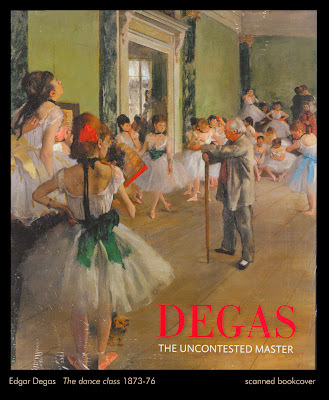 Ding Roces and I were just about to take a photo of Degas' little ballerinas when the guard (who looked Pinoy) seemed to tell me with a Taser-arresting look "Dega' muna pare, bawal magkodak dito" (hang on mate, no snapshots allowed here). 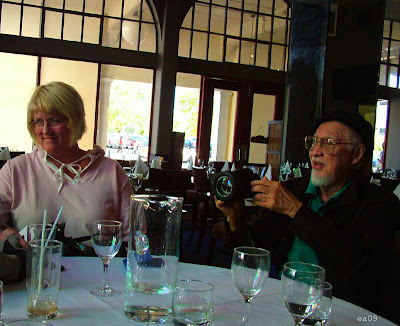 But instead he smiled when I asked if we could and said "Thanks for asking anyway but we do apologise; we used to allow it but now with high resolution digital cameras, y'know..please enjoy Degas." Ding, Mario Aldeguer and I looked at each other puzzled. 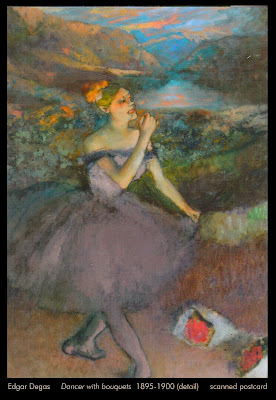 What are we going to do with these light but bulky cameras we brought specifically to shoot Degas? 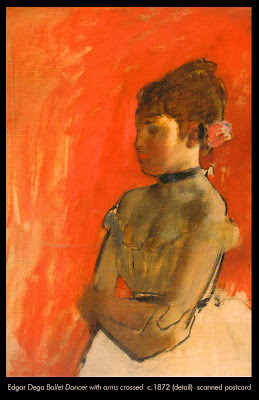 Sacre bleu how on earth can i blog Degas without images of his exhibited works? I looked around..aha! 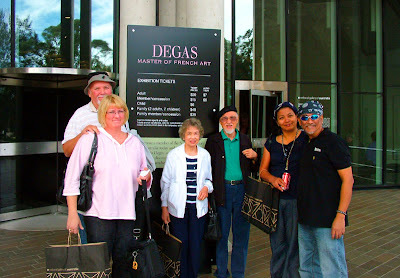 There lied the answer on the west wing of the gallery- The Degas merchandise shop!. Still no photography allowed here tho' Mario and I were able to sneak some in the foyer. On sale with Degas theme were French-striped folding chairs and shirts (more of Monet painting elements tho), books, posters, bookmarkers and POSTCARDS (way to go captain obvious, they're hot sellers in camera-unfriendly galleries ;). 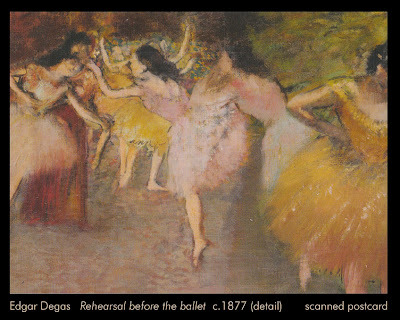 So here are scanned Degas postcards I bought from the NGA shop (all across this blog entry) courtesy of my feisty scanner to compensate for the photo eclipse in the National Gallery of Australia (C'mon guys, you must allow photography! It's good for tourism, it promotes your artists (dead or alive). Can you imagine my souveneir photo of my visit in Paris without the Eiffel crane in the background? Inimaginable! What about those commercial spy cameras that can be hidden in eyeglasses, neckties or in my dentures (like I can snap a picture everytime I smile:). So are you thinking of frisking everyone? That would be such a turn-off! So I tell you forbidding photography in your gallery is quite futile. 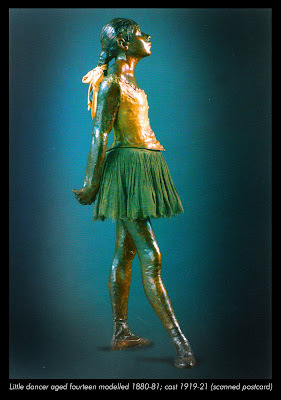 Didn't you know that Google Images can regurgitate most of Degas' works in good print resolution? So what's the big deal? People come to galleries to see the paintings and harmless snapshots shouldn't be of much concern. Gatekeepers of the arts must not stifle the public's natural behaviour to record events! It's the same desire that also compelled Degas to use a camera, albeit using a pinhole. Nevertheless we witnessed Degas' photographic works, his subjects often his friends (including sculptor Auguste Rodin!) However If I were to grade his photographic works I shall fail him! LOL! The shadows were too dark, the poses were rigid, the lighting was hopeless and my phone camera can do a better job (just kidding! :) Of course during his era his works were considered awesome! 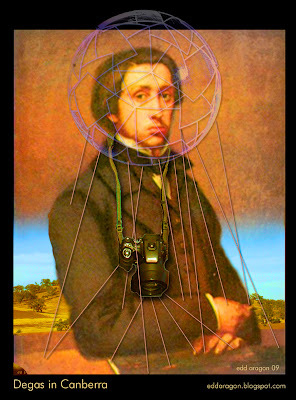 But did it bother him that one day the camera shall render his paintings obsolete? No, and that's why his paintings still tour the globe for his fans to hold on for inspiration. Meaning: It is very good to copy what one sees; it is much better to draw what you can't see any more but is in your memory. It is a transformation in which imagination and memory work together. You only reproduce what struck you, that is to say the necessary. 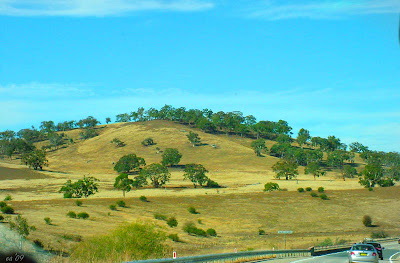 We left Sydney early in the morning and with the skillful driving of Mario it took only a little less than 3 hours to see the welcome sign of Canberra. Lene, his wife, held a GPS and so losing our way in a remote place was quite remote. It was a smooth drive inside an almost new Toyota Tarago (Australian aboriginal word for country) hired for the six of us, seven if Jim Paredes was able to come (busy with Jon Santos' April show in Sydney). 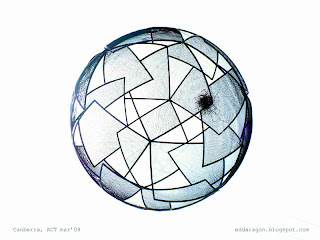 First to intrigue visitors is a metallic sculpture (above image) with random shapes welded together to form a globe. 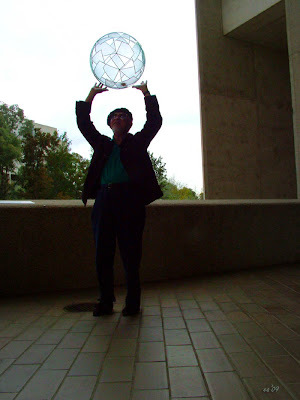 It hung above the facade of the NGA with thin wires and was a meshwork of art made more intriguing by the intrusion of a bird's nest. It looked symbolic as an editorial cartoon floating in the sky, the statement something like man and nature can co-exist. 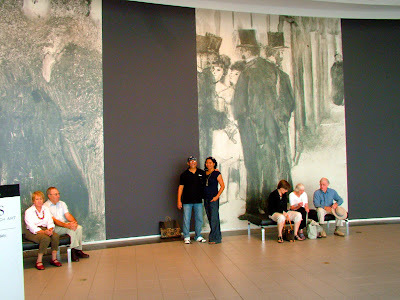 A group of excited schoolchildren went past before me like a moving curtain to reveal the horse racing images of Degas. I was taken back in time. I was looking at the primordial images of horse racing. The ancestral Phar Laps of an ancient Melbourne Cup were all in detail. Did you know one goes inside and become part of a painting to appreciate it? 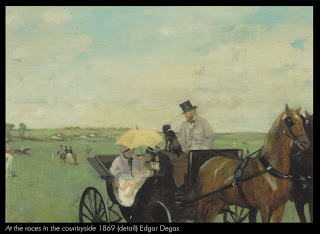 Ding had keenly observed the works and discussed the deliberate cropping of his painting composition, like half a human image here and half a horsecarriage there. It's like him saying "Hey I need not paint the whole potato if you know part of it is a potato!" Fair enough I thought. Indeed the master was an experimentalist, a shaker for change. But where are the people? Street scenes with two or three pedestrians on the road seemed common. It was a sunny Thursday (usually payday) afternoon and it's the city's rush hour! 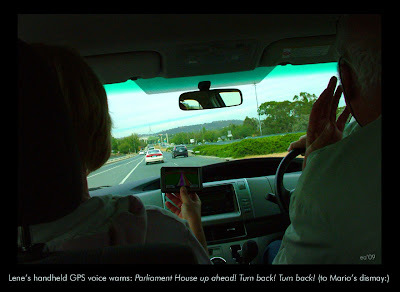 :) I stuck out my head outside the vehicle and addressed the grey buildings and empty streets with a muffled scream: Wake up Canberra! It's recession, not hibernation! Lemon grass is good! Tanlad in Filipino, it's a common ingredient of Thai cuisine. Earlier I showed Irene (Ding's green-thumbed wife) my little pot of lemon grass growing in my garden near a saba banana tree which they gifted me last year. Lemon Grass is also the name of a Thai restaurant in middle of Canberra's CBD. After seeing the exhibit courtesy of some generous souls who held concession tickets, we walked around and scanned the restaurant block. Somewhat like a Russian roulette we found ourselves sat inside this Thai restaurant that looked more like a British pub. It must be the tanlad's residual image in our mind that ushered us in. Pud Thai and satay woke up my restless taste buds with a series of delicious explosions of spicy flavours downed by an ice-cold favourite cola. 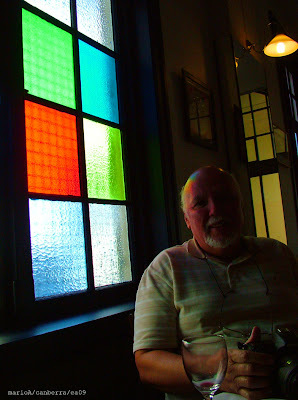 The stained-glass windows filtered the Degas skies and caressed the glassware on our table. That red pepper garnished on garlic rice reminded me of the bright red ribbons of Degas' ballet dancers.